The Teranex Mini Optical to Analog 12G Converter from Blackmagic Design allows you to convert up to a 12G-SDI signal to analog BNC output, or install an optional optical fiber module and convert up to 12G fiber signals to analog. You can input up to DCI 4K (4096 x 2160) 60p signals, and they will get automatically downscaled to 1080p30 on output. Connect your high-resolution sources to a variety of analog equipment. An optical fiber module is not included but is supported on the rear. 3G and 6G modules are currently available (model #s ADPT-3GBI/OPT and ADPT-6GBI/OPT), and 12G modules are in the works. The Teranex Mini Optical to Analog 12G Converter also features full-size XLR outputs that are switchable between balanced analog and AES/EBU digital audio, and which allow you to output separate audio. The converter also has an Ethernet port that allows you to manage the converter remotely from a Mac or Windows computer using the included Converter Utility software. This capability is especially useful when you're in a larger facility using numerous converters. The Ethernet port can alternatively be used for Power-over-Ethernet (PoE). If you don't want to use PoE, you won't have to deal with cumbersome power supplies, as the Teranex Mini features a built-in 90-240V power supply, and all you'll need is a standard IEC power cable, sold separately. The Teranex Mini can be used rack-mounted, concealed in cable ducts, or desktop-mounted. 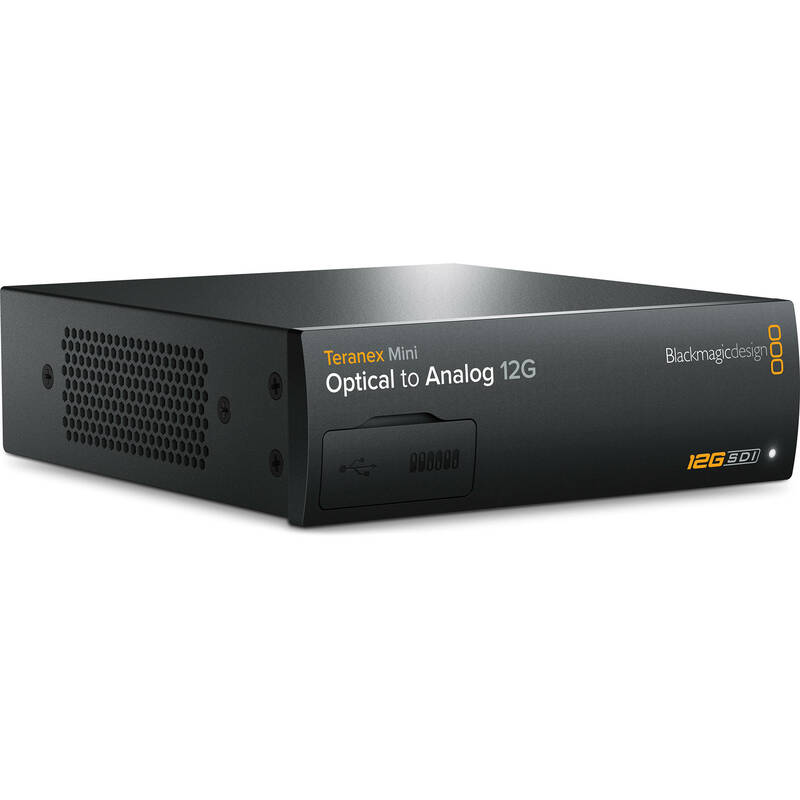 Its compact size makes it useful for portable racks at live events or in broadcast trucks. Up to three units can easily be installed in an optional 1 RU 19" rack tray. The standard front panel can be replaced with an optional Smart Panel that offers a spin knob, color LCD, and six control buttons, including a menu button. The substantially large LCD will show you the video conversion in progress and will also let you monitor audio levels and verify timecode. The standard front panel simply comes off and the Smart Panel easily attaches in its place. When you're using the standard front panel, you'll have access to an array of mini switches that will let you change settings instantly in correspondence with a diagram printed on the converter. If you swap in the optional Smart Panel, you'll instead be able to use simple on-screen menus while seeing exactly what you're converting. The Teranex Mini is designed with intelligent heat dissipation that prevents overheating. What makes this feature so effective is a smart thermal design with crossflow cooling that achieves the optimal heat dissipation even when you have units rack-mounted side-by-side one another. An intelligent thermal subsystem and internal heat pipe assist with cooling and keep the air flowing at all times while minimizing noise. Moreover, if the Teranex Mini gets too hot, you'll instantly receive a notification through the remote control Ethernet utility and on the front panel. When multiple units are rack-mounted side by side, each Teranex Mini works together to pull air through the rack, keeping all units cool and providing redundancy for each one. Box Dimensions (LxWxH) 9.0 x 7.8 x 2.4"